We can't say enough about the benefits of Parisi Speed School. In April of 2013, we started the process of recruitment. We visited 16 schools and met with all of the coaches at all of the schools. Each coach commented enthusiastically about Lyndsi's running form. Being a pole vaulter is very technical. You need speed, strength and proper running form. One coach said he had never seen running form like that on a high school pole vaulter. One coach said that if Lyndsi attended their school, the coach would not have to break anything down or fix anything about her run. Being an ex gymnast required us to find a program that was challenging, intense and safe. We like everything about the Parisi program. We especially liked that for one of Lyndsi's strength classes they geared it just to pole vaulters. The combination of strength and speed classes definitely helped Lyndsi to pole vault to the best of her ability and Parisi has helped Lyndsi immensely in her signing with Dartmouth College class of 2018. Obviously we would and often do recommend Parisi to anyone serious about their athletic career. It's a necessary component to success. I have battled with shin splints (now turned compartments syndrome) since freshman year in high school. Parisi has helped me overcome an injury and taught me how to prevent further injuries. If it weren't for the training I did at Parisi, I would not have been able to continue to play high school sports and go onto play division one field hockey. I gained the confidence I needed to pursue higher athletic competition. I could see the improvements I was making. I could see and feel myself getting faster and stronger. The positive encouragement to push your limits is something I haven't experienced anywhere else. I have and will continue to recommend the program to friends. My name is Thomas Mack and I started Parisi Speed School in February 2012. I am in 8th grade and my goal at Parisi is to become stronger, faster and to gain a greater confidence in myself in order to become the best football player I can be. I am so grateful for the opportunity to be able to train under such a great group of trainers. I couldn’t ask for more. I have learned so much and accomplished so much that I have even amazed myself. Everyone at Parisi is awesome – the trainers right down to the athletes who train under them. The best part about the program is the trainers. To describe them in one word would be –AMAZING! You can see and feel their passion for training once you are in their class. They expect nothing less than the best of your ability and are always there if you need them, even just to talk to. Since I have been at Parisi I can honestly say that the confidence in me has never been higher. That is because of them. They have helped me through some challenges that I needed to overcome and if it wasn’t for them, I may not have continued on with football. Physically, I can’t say enough about the improvement I have made. I attend Parisi 4-5 days a week and wouldn’t change a thing. The feeling when I walk in and out of class is so rewarding and there is no better feeling than that. I would recommend the program to everyone. If you want to become a better athlete, than Parisi is the place to be. They know what they are doing and the most important thing is, they care. 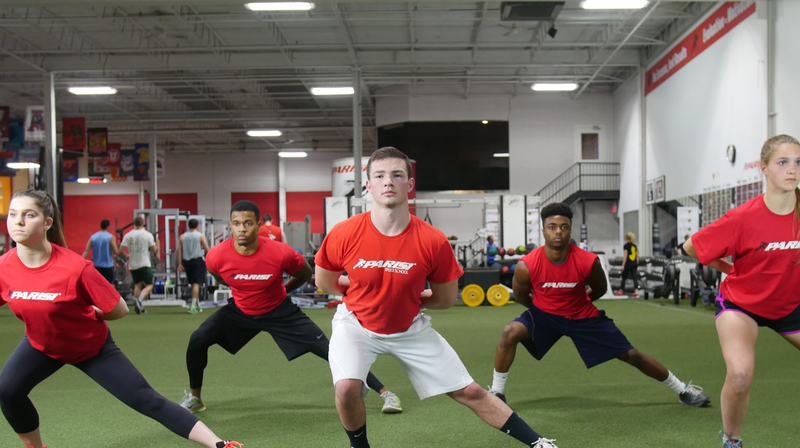 Training at Parisi Speed School has improved strength, flexibility and speed, most notably explosiveness. Results are clearly reflected in athletic performance. What I most like about the program is the self-confidence the Parisi program instills in the athletes. This is in large part due to the outstanding trainers who tirelessly motivate and encourage. I have recommended the Parisi program to friends, and will continue to do so. Simply put, you and Steve are amazing…..what a GREAT experience for the Summit Boys LAX team…. Well done Chris – you guys are great…Let's build it! Can't thank you enough Chris - you are awesome. Parisi Speed and Agility has allowed my team to become faster, stronger and use the skills learned to attack every phase of the game. We have taken a brand new group of girls and with the help of Parisi we have shown results that would take years to happen. The girls have confidence about themselves that comes from working hard over the winter on brand new skills that allow them to compete Nationally. Thanks Parisi for giving our girls the extra advantage they needed for our run at the Nationals. Parisi has had a tremendous impact on my daughter. First and foremost, it has helped spawn a love of fitness, health and well being in her. She now views health and fitness as an essential part of a happy and healthy lifestyle. Additionally, she has become a very hard worker, something she (and I) credit to her time at Parisi. She started working out with the trainers there in 7th grade and saw quick and impressive results when she applied herself. This established a consistent work ethic in her and has helped her become very goal oriented. She recently earned a scholarship to a Division I lacrosse program and a primary reason was her athleticism and fitness. All of the coaches who recruited her commented on her speed, agility and fitness...all of which are direct results of Parisi. What I like most about the program - As a parent, I am most pleased that she has learned to love and embrace health and fitness. The trainers at Parisi always made training and goal setting fun for her. As a result, she has learned to apply the same dedication and work ethic to all parts of her life. I have recommended Parisi to many people over the years and will continue to do so. The impact that Parisi Speed School has had on both my sons aged 10 and 12 has been three fold. It has given then confidence due to the repetition and encouragement of the trainers, gave them some kids from other towns to compete against, and the pride of being part of a speed training program that the sky is the limit. What I like most about the program is that each session is slightly different, trainers rotate, the excitement never gets stale. Not only would I recommend to a friend, I already have! Parisi Speed School has had a great impact on my son, Jake, in that he feels more confident in all the sports he plays. He has learned the proper form and technique it takes to have an edge in the game. All the trainers are willing to work with each child on an individual basis. They really know your child and want to see them succeed. They push when they need to yet are very caring. The gym has everything your child needs to have proper training. Jake looks forward to going because he really likes the staff and the program. We are always recommending Parisi Speed School to all our friends. The reason behind this is because whenever Jake is done with all of his classes, he is tested and has always improved in each category. So, if you are on the fence whether to join or not, just join!